J azz lovers look forward to the third weekend of September in much the same manner that Indy car race fans anticipate Memorial Day, lovers can't wait for Valentine's Day and children pine for Christmas Day. 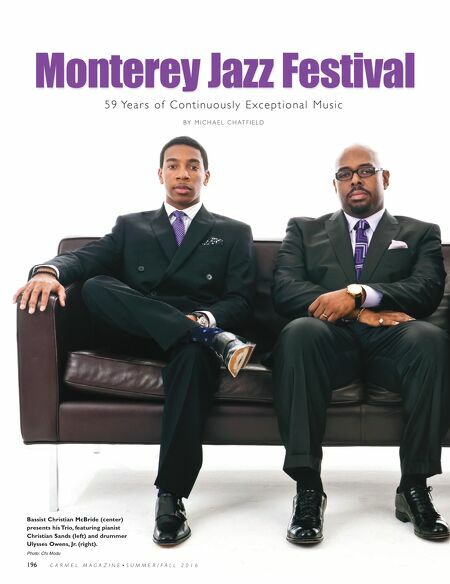 For them, the Monterey Jazz Festival is all those holidays…and more. It's a feast for the senses—not just the ears. The aromas and flavors from the exotic offerings of the food booths and the sights of the dressed- to-the-nines crowd comingle with the sounds of the distinctly American music called jazz played by the world's finest practitioners of the art to create an unequalled sensory delight. Even the venue is special: The Monterey County Fair and Event Center has played host to a Who's Who of the musical world, from Jimi Hendrix to Dave Brubeck, from Bob Dylan to Ella Fitzgerald, from The Who to Herbie Hancock, from Gladys Knight to Dizzy Gillespie. This year marks the 59th outing of the world's longest continuously running jazz festival and the lineup is, as always, stellar. Two American musical legends will be hon- ored with tributes on the Jimmy Lyons Stage. First up is a "Tribute to Quincy Jones: 'The A&M Years.'" This all-star cast will be led by musical director, bassist, composer and bandleader Christian McBride and conductor John Clayton. 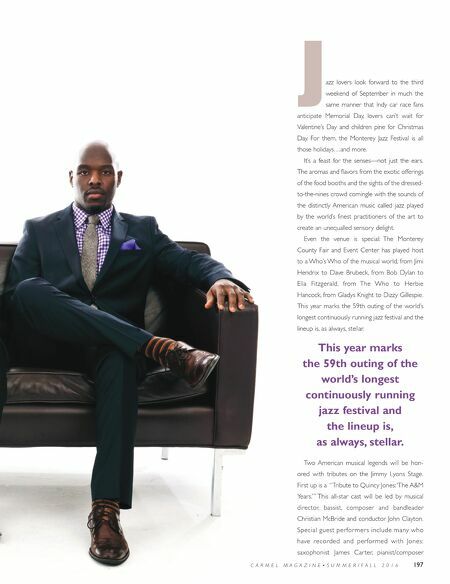 Special guest performer s include many who have recorded and performed with Jones: saxophonist James Car ter, pianist/composer C A R M E L M A G A Z I N E • S U M M E R / F A L L 2 0 1 6 197 This year marks the 59th outing of the world's longest continuously running jazz festival and the lineup is, as always, stellar.